Background Physical activity is crucial for the management of rheumatoid arthritis (RA). In the Physical Activity in RA 2010 (PARA 2010) program we evaluated a one-year health-enhancing physical activity (HEPA) intervention. It included circuit training at public gyms twice a week and daily free-living physical activity of moderate intensity, framed by 20 bi-weekly support group sessions led by a physiotherapist. The PTs were trained to facilitate HEPA behavior not only by instructing exercises and check exercise intensity, but by inviting participants to share their experiences and give social support as they strived to reach HEPA. Integrating these communication competencies may be challenging to PTs, traditionally providing expert advice on exercise and physiology. 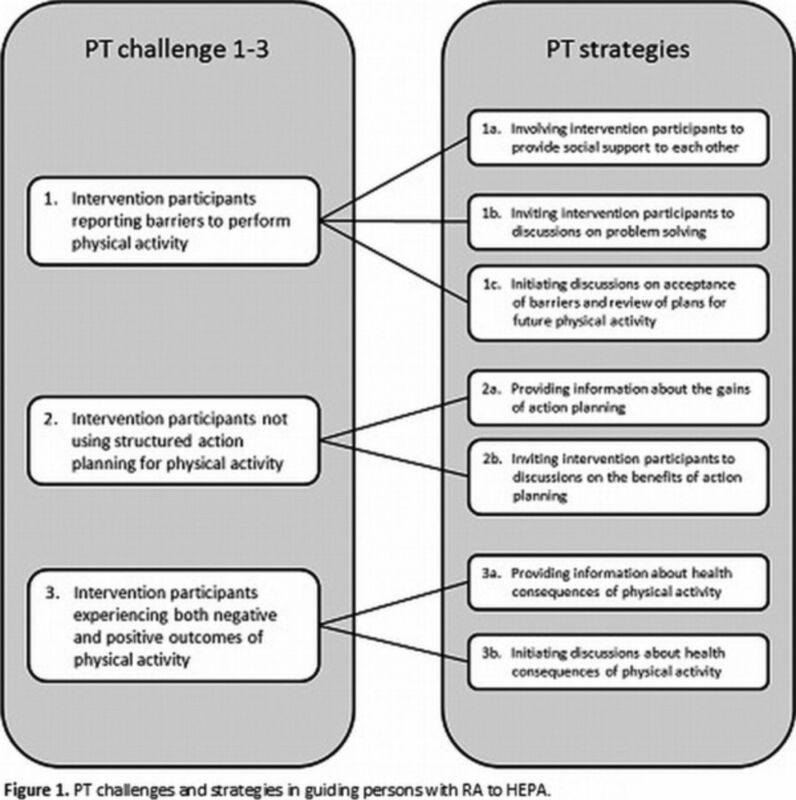 Objectives The aim was to explore strategies that PTs use to manage challenges when guiding persons with RA to HEPA behavior within a one-year intervention. Methods The study was exploratory and descriptive. Eleven PTs, all women, were included. To prepare the PTs for their group leader task, they participated in a six-day skills training course and received a written manual for the support group sessions. In addition, they received individual feedback on performance during group sessions twice during the HEPA intervention. Data were collected by video recordings during altogether 22 support group sessions ranging from 46 to 78 minutes in length (mean 57 minutes, 1433 minutes in total). The analysis procedure was performed by three researchers in three stages; a preliminary review, a substantive review and an analytic search according to Heath et al (2010). Results Analysis revealed three categories of challenging situations deemed to be of clinical relevance for PTs and other health professionals promoting HEPA in patients. The challenges occurred while the support group participants perceived barriers to performing physical activity, when they neglected using the diary for planning physical activity as intended in the program, and when they experienced a mix of negative and positive outcomes of physical activity. The analysis yielded eight strategies PTs used to manage these three challenges (Figure 1). The strategies either focused on provision of information or on involvement of group participants in discussions. The PTs switched back and forth between strategies, demonstrating that they adapted to different situations. Conclusions Our results are promising for future initiatives to integrate PTs' traditional information-provision strategies with strategies facilitating participation by inviting group participants to interaction and discussion, potentially enhancing the uptake of HEPA interventions in group formats. Heath C, Hindmarsh J, Luff P. (2010). Video in qualitative research. Sage Publications Ltd.
Nessen T, Opava CH, Martin C, Demmelmaier I. (2014). From clinical expert to guide: experiences from coaching people with rheumatoid arthritis to increased physical activity. Phys Ther, 94(5):644–53. Nordgren B, Fridén C, Demmelmaier I, Bergstrom G, Opava CH. (2012). Long-term health-enhancing physical activity in rheumatoid arthritis. The PARA 2010 study. BMC Public Health, 12, 397.